You should always speak you mind and thankfully most of us can, regardless of where they're from. If a buyer has a certain distaste for a particular shipping vehicle or method he should make that clear before closing the deal. Something can always be arranged...surely. My point for jumping in on this thread is simply to say that both the seller and the buyer have an equal responsibility. Matt I, Shawn and MYKE like this. The most amazing I have now seen personally, came from Import CDs recently, via a large eBay store purchase. The mailer was built to sustain the weight of the Pulse box, plus 3 double albums, all on 180g vinyl. When I cut the nylon-reinforced packing tape, the box had to be "unfolded," then there was a lid with a flap that tucked in, exposing a very deep well-like box, in which all these albums rested comfortably. I used to know someone in tool and die, who has since died, that I thought would appreciate this marvel. Dave and Matt I like this. If I take an LP that's packaged in a cheap mailer, and simply drop it at a height of say, 5-6 feet, the mailer (and possibly the cover inside) is going to incur a ding if it lands on a corner. That's a fact. Now consider all of things that could happen when it's in transit for days on end. Don't understand how it's the buyer's responsibility to request that the seller not use substandard packaging, but we'll just have to agree to disagree on this. As an experiment, here's a cheap mailer that was just dropped from a height of 5 feet. I didn't even have an LP inside of it, so just imagine if you were to add an extra pound or so to its weight. Yeah, I have too much time on my hands today. Perhaps "responsibility" is the wrong word, but given what you just described wouldn't it be in your best interest to ask the seller and possibly avoid inferior packaging. Expecting the seller to know your standard requirement for packaging is unrealistic and rather unfair. klownschool, Shawn and Trace like this. When they're a professional retailer ? Or are you referring to some guy in his basement ? Anyone. All it takes to avoid these situations is for both parties to communicate. I've had people ask me how I package and what I use. No big deal. I show them with pictures. Not only does that give them a sense of security, it also provides me with protection for some (and there have been a few) who claim otherwise. I guess my expectation would be for the seller to not use inferior packaging to begin with. Not sure why I should need to communicate this though. Especially for an LP that I paid $50 for. My favorite type of box! I guess my expectation would be for the seller not to use inferior packaging to begin with. Not sure why I should need to communicate this though. That would normally be my expectation as well, and when I buy/sell here and a few other places it's not concern. However, if I'm buying something of substance from an unknown (to me) site I have no hesitancy in making inquiries about shipping. What this does is establish a trail, so if anything other than what was claimed to be used is sent, I have a paper trail to back me up. Anyone. All it takes to avoid these situations is for both parties to communicate. When they're professionals, I expect them to know enough to not use a pizza box. Acoustic Sounds, Music Direct, Bull Moose, I would never think to question them, in fact, it's as @Shawn says upthread, some go out of their way to assure us they know what they're doing. Shawn and Johnny Vinyl like this. The example box shown is a fairly standard LP mailer, so I wouldn't call it inferior or substandard. I'm sure we all could give examples of truly substandard shipping. 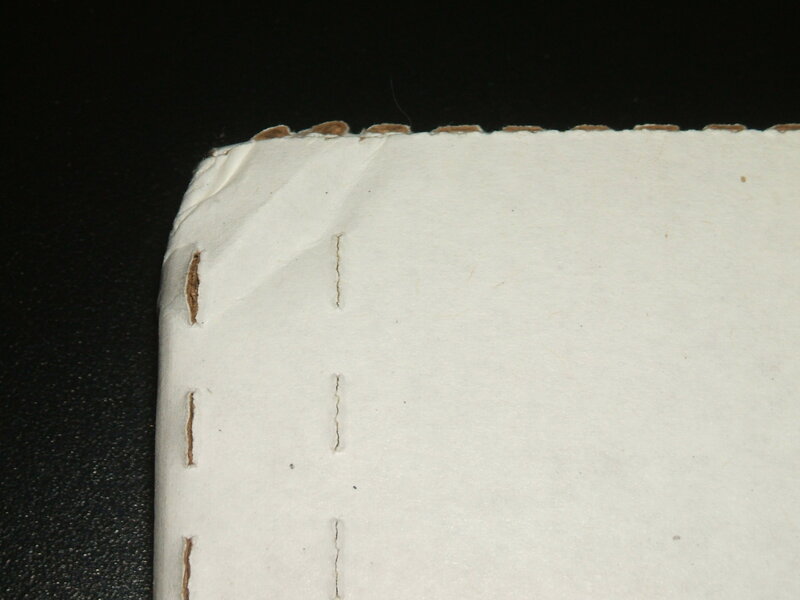 My favorite is a shipping label stuck to an LPs shrink wrap, but that was on a new $25 LP. There is nothing wrong with asking the seller beforehand what kind of mailer they use or if they can beef up the packaging. Most sellers will gladly take requests to ensure your package arrives alive. zongo and MYKE like this. Never an issue with those you mentioned. It's the eBay sellers or other independent dealers I've never dealt with that concern me...and should concern you. Agreed. I add this message to almost all my online (eBay/Discogs) purchases. "Please use additional stiffeners in the package because our mail carriers are gorillas." Sometimes it works, sometimes it doesn't. Of course, that doesn't address Amazon, where you can't really leave a comment like this. And that's why I asked you to specify, and you responded "anyone." I think a key ingredient is to use inserts on both sides of the LP. Many packages I get even from good Ebayers will just have one cardboard insert. Two inserts really give the extra stability so the record doesn't slide around in the package, as well as another layer of protection. In fairness the USPS can still wrench on these and hurt them no matter how well packed. I'm still shocked that the expensive LPs I've purchased from the UK have arrived safe in those weak light cardboard jobbies they sell over there. There's a lot of pucker in the 10-14 days waiting for one of those to arrive. ScramMan2, zongo, nosliw and 1 other person like this. This morning, I see my album has been scanned Delivered. I step out on the porch, nothing. I go back inside for about 5 minutes or so. Confused, I step back out. Just then, the Amazon van pulls up. Kid gets out, hands me a small bubble mailer.
" No, I'm not this guy, and my purchase is an album." Goes back, gets my album, we exchange. Didn't he just scan a much larger package not 4-5 minutes earlier ? Sure glad I was home. Dave, Opeth and Matt I like this. The example box shown is a fairly standard LP mailer, so I wouldn't call it inferior or substandard. There are better options available nowadays which offer corner protection. Standard mailers do not protect corners at all. So technically, they are inferior, no? No, they are standard. You are expecting premium. A pizza box would be inferior, a huge U-Haul moving box would be inferior, or a label stuck to the shrink wrap would be inferior. Your example is standard, so if you expect premium ask about it and don't make an assumption. Johnny Vinyl and zongo like this. Just rec'd my copy of Mountain Climbing ! from Rick, and I believe this is my first experience with a Whiplash. Very impressive !!! The design, and strength only required two flat pieces on either side ( like @Cassius said upthread ), and the "well" the record sets in is exactly the size of the jacket, with the heavy duty bumpers on two sides, this is a superior mailer ! klownschool and Shawn like this. I use Whiplash mailers which I mention in my listings. Rekkerds, Shawn and MYKE like this. I thought you were referring to something worse, I've got many that are like an envelope with slightly thicker cardboard (if you can call it that). Ironically the ones I've received with damaged covers due to the postal system carelessness were the ones properly packed. I had a seller send me a CD box set -- the old school 6x12 kind with individual jewel boxes inside -- in a plain manila envelope. At the time, the box was so scarce I didn't bother with a return. I have 20 yrs experience trading on-line and this kind of irresponsible attitude really gets old. Those cheap LP mailers do not protect a record sufficiently. Most records shipped in that type of mailer will be damaged to some extent. If you choose that type of mailer for its low cost and convenience then you should expect some returns. Many people won't notice the damage and some won't say anything. Occasionally you get lucky and the record arrives without damage. That is why resellers keep using them. Shipping damage is 99% avoidable with appropriate packaging. Nobody can blame USPS, Fed EX or UPS at this point. Everyone knows how they handle packages. It's never going to change. It is what it is. It is on the seller to package the item in such a way that it will not be damaged. If you don't there will be some returns and complaints. Take it in stride because it is the result of you own business practices. Gumboo, zongo, GentleSenator and 2 others like this.